GroupBox is used to layout a logical group of controls together, within a titled visual frame. 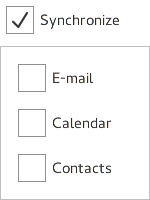 GroupBox does not provide a layout of its own, but requires you to position its contents, for instance by creating a RowLayout or a ColumnLayout. Items declared as children of a GroupBox are automatically parented to the GroupBox's contentItem. Items created dynamically need to be explicitly parented to the contentItem. If only a single item is used within a GroupBox, it will resize to fit the implicit size of its contained item. This makes it particularly suitable for use together with layouts. Even though GroupBox has no built-in check box, it is straightforward to create a checkable GroupBox by pairing it with a CheckBox. It is a common pattern to enable or disable the groupbox's children when its checkbox is toggled on or off, but it is up to the application to decide on the behavior of the checkbox. See also CheckBox, Customizing GroupBox, and Container Controls. This property holds the label item that visualizes title. This property holds the title. The title is typically displayed above the groupbox to summarize its contents.